Advocates from Suffolk County piled onto a bus destined for NYAPRS Legislative Day in Albany on February 25, 2015. I was impressed by the spirit of determination and great hearts of those who braved the cold to speak out for people struggling with mental health, substance abuse, and trauma-related conditions, particularly our brothers and sisters who are homeless and literally left out in the cold. Advocates spoke about the great need for affordable housing on Long Island. People came ready to share with legislators and their aides their own stories of homelessness and hopelessness and how, once supports and shelter were in place, they were able to get their lives back. I was amazed and humbled by the courage of each and every person who opened up to elected officials in the hopes of making a positive difference. Humane and just treatment was demanded for those caught in cycles of addiction, incarceration, and hospitalization, where gaps in supports leave them with no place to go and no one to rely upon. Suffolk County advocates attended appointments with Senators LaValle, Flanagan, and Boyle, and Assembly members Theile and Polumbo. 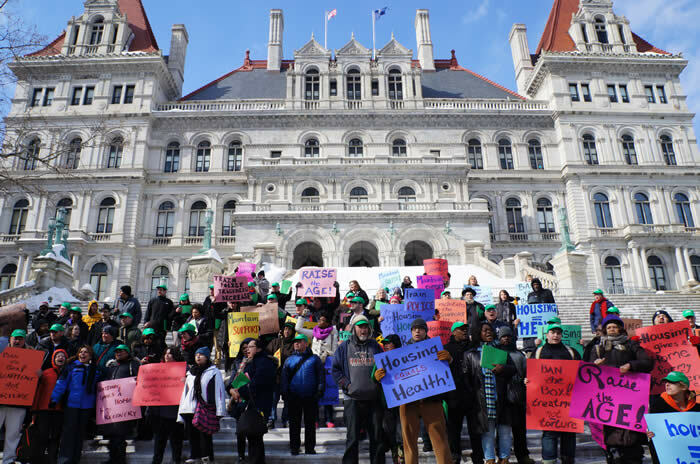 NYAPRS proposes that $82 million be allotted to 35,000 Supported Housing units across New York State, for which advocates on Long Island emphasized in meetings with legislators. The energy in the the Empire State Plaza’s Center for the Performing Arts — commonly called “The Egg” — was electric. We heard from OMH Commissioner Ann Marie Sullivan, our NYAPRS representatives, and many more. Assembly Criminal Justice Committee Chair Daniel O’Donnell gave a particularly moving speech about injustices within our judicial system. Our discussion about housing and homelessness on Long Island continued on the bus ride home. It was my joy and honor to coordinate the trip for the powerful group of advocates from Suffolk County. Julie, keep up the advocacy. There’s power in passion and power in numbers. I had an enlightening time at Legislative Day. 48 million Americans go without health insurance. It was enlightening to see how so many of us from the psychiatric community could come together to advocate for housing, Medicaid, and criminal justice reform. It is so great as a worker with a disability to see people come together to remember what it is to have a psychiatric disability. I am so thankful for the leaders from the Association for Mental Health and Wellness as well as Aid to the Developmentally Disabled for helping us all to get there and come home in one piece.